Another week of October has flown by and that means another poster for the upcoming 10th anniversary of SAW returning to theaters is here. The fourth poster of the five limited collection series has been unveiled and even star cary Elwes has weighed in on his thoughts on the anniversary. Check out them both ahead and get ready to see SAW in theaters this Thursday and Friday along with the final poster unveiling. The countdown is almost over! 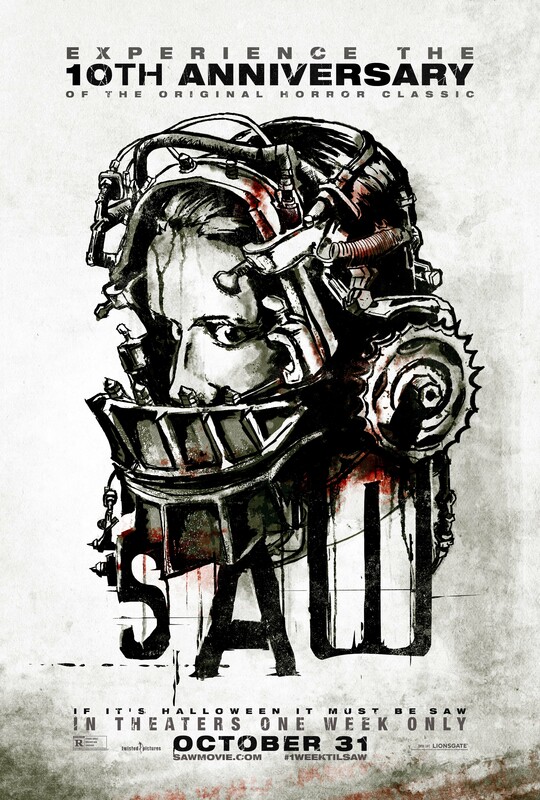 SAW will be returning to theaters to celebrate its 10th Anniversary next FRIDAY, OCTOBER 31ST! In anticipation of the re–release of this ICONIC horror film, we’re thrilled to share the FOURTH collectable poster. Check out the gripping poster below, and be sure to head to theaters on the evening of OCTOBER 30TH to be the first to experience the epic return of the unbelievably twisted serial killer, Jigsaw!